Backed with immense industry-experience and knowledge, we are involved in offering Hygienic Slurry Pumps that are used for pump out slurry materials in cement industry and mines. These slurry pumps are specifically designed for pumping fluids with abrasive solids. Our slurry pumps are checked on varied parameters so as to deliver a fault free range. Offered slurry pumps are accessible from us on numerous specifications to meet the demand of customers in a committed time frame. We are identified as one of the most competent enterprise of this industry for offering a wide gamut of Hygienic Screw Pumps. 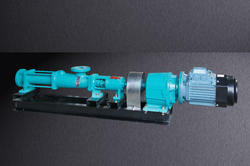 These screw pumps are utilized in chemical, cement, food processing, and water treatment plants. Offered screw pumps are developed by utilizing the top evaluation material and present day innovation as per the set business standards. Our customers can avail these screw pumps at industry leading rates within in a given time frame. With huge technical knowledge & industrial experience, we are exclusively involved in providing a wide spectrum of SS Hygienic Slurry Pumps. Our offered pumps are used for transferring different fluids from place to place in various industries such as chemicals, beverages and many more. 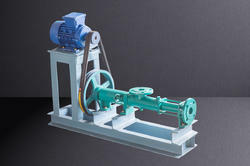 The offered pumps are comes in diverse specifications to meet the several demands of customers. We are giving these pumps from us at nominal rates in a given time frame. Looking for Hygienic Pumps ?